I am so thrilled to be a part of the book tour for Tinkerlab: A Hands-on Guide for Little Inventors. 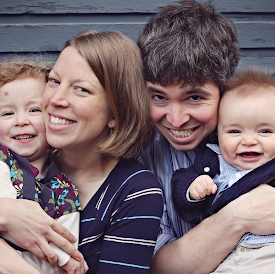 I discovered Rachelle's amazing website after I started blogging and loved that we shared the same ideas about play. I was so excited to hear that she was working on a book at the time and feel so fortunate to have gotten an advance copy and been able to participate in her book tour. My favorite thing about the Tinkerlab book is that, like the website, it focuses on open-ended play. As a former science teacher, I place a very high value on allowing kids to "tinker". Not only is it great for creativity, but it also helps later in life with problem-solving and develops a skill set useful in just about every profession. The super fun activities in the book (over 55 in total!) are divided into four sections: Design, Build, Concoct, and Discover. 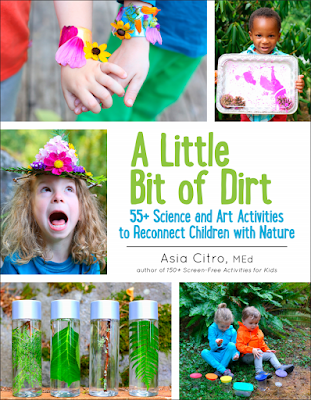 The overarching theme of the whole book is allowing children the space to tinker and experiment. Though we had a hard time choosing which activity to try first, S and I decided to build the Drawing Machine. My scientific background is in the life sciences, so wires and circuits are not really my thing. S LOVES them though, and thanks to the incredibly clear directions in the Tinkerlab book (after our supplies arrived via Amazon) we were all giggling as the Drawing Machine danced around our dining room table drawing up a storm! I love that after every activity, Rachelle lists some ideas for how to experiment further. This is what science is all about! Following her advice, we then designed and built a Spiral Rainbow Drawing Machine. Using many of the same pieces (and a lot of tape), it was so cool to see that we could make an entirely different robot/pattern/experience! 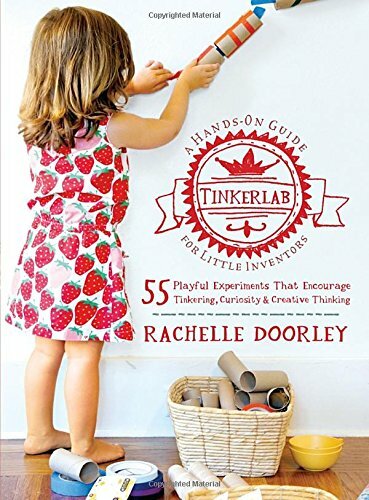 The book has a wealth of information on how to set up your house to encourage tinkering - we've already taken Rachelle's advice and purchased an art cart identical to hers. 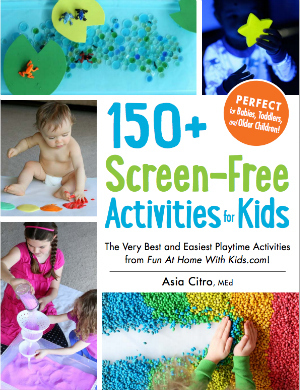 :) We highly recommend this book to anyone with kiddos six and under! You can find even more book reviews via this landing page for the Tinkerlab Book Tour and you can see a list of Book Tour Events on Rachelle's site here. 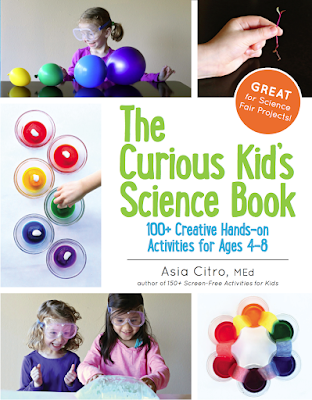 And one lucky reader will win a free copy of the Tinkerlab book! This giveaway is open to readers with a US, UK, CA, and AU address. Winner must respond to the email notification letting them know they've won within 48 hours or another winner will be selected. Looks like fun! I'll have to put this on the kids' wishlist. This looks like such a fun book! I would love to try these robots with my son. He would be amazed at building a robot. My non-scientific mind would definitely need help. This book looks so awesome! And the drawing robots are soooooo cool. Fingers crossed! This looks like a lot of fun, we rarely have spare money to go out and do things and I feel like we've done just about every craft on pinterest. Thanks so much for hosting! Thank you so much for this giveaway. Today we are filling our little wade pool because yesterday our air conditioner finally died. I honestly was surprisedhttp://www.funathomewithkids.com/logout?d=http://www.blogger.com/logout-redirect.g?blogID%3D3750283367328263528%26postID%3D5878009933183787213 it lasted as long as it did. I'm always looking for ways to keep the kids entertained and your site is always a good place to find ideas. Thank you so much, Karen! The book is so fun! I am not naturally crafty or inventive and our son clearly needs that so this would help immensely. This is such a great resource! Fingers crossed for you! Oh that would be so much fun! What a fun grandma you are!!! My fingers are crossed for you, too! I would love to win this book. It will be great to plan fun exciting and engaging fun things to do as my son is always hungry for learning and playing at the same time. Thanks. Hope you win, Nedia! This sounds like the perfect book for him! That financial hardship thing is really cool! Doesn't apply to us, but I would have really appreciated it a half a year ago when my husband was out of work! Thanks for being so nice. Thank you! It's always extra exciting for me when I get to give something to someone who really needs it. :) So glad that your husband has since found work! And good luck in the giveaway!! Trying to feel lucky on my final day of teaching summer preschool and enter your book giveaway. Unless enrollment increases in September, my hours will be cut in half so I am grateful for the opportunity to double my chances. This hands-on guide looks like a wonderful resource! Oh no, Leanne! So sorry to hear that. I am hoping that enrollment spikes as people are starting to think about back to school. :( Fingers crossed that you win the giveaway as well! I love getting Rachelle's email newsletter each week so I know I will love her book! Thanks!